I love the challenge and reward of hilly races. But, I live (and train) in an elevation-deprived area so many of my key workouts involve simulating hill training in order to get race-ready. You’d think that maybe I would give up on hilly adventures. But, that isn’t the case. I’ve raced on some of the most iconic hilly terrain— from IRONMAN Lake Placid to running Rim-to-Rim-to-Rim in the Grand Canyon. It’s possible with some creative twists to training. Do you live in an elevation-deprived location, but hear the mountains calling? Then, this article is for you! Let’s cover some options for the bike and run. Your training should prepare you to meet the demands of your event. What do you need to tackle hills? Strength and cardiovascular fitness. Your general training will support your overall fitness, so our tips focus on building strength – body and mind – for the climb. A staple session is the big gear workout, which includes using the front big ring, and a low rear gear. This combo creates resistance, which in turn helps build your strength. You can modify big gear workouts for indoor or outdoor riding. On the trainer, raise the front wheel slightly to mimic the position of climbing. If you are outside, ride big gear into a headwind; we call this approach the “South Jersey Hills.” If you have a smart trainer, you can ride simulated hilly courses, which will allow you to build strength, which can help you learn how to gear for elevation changes. 1- to 2-minute recoveries, easy spin at a higher cadence, 95+ rpms. Cadence for the main sets is between 60 and 70 rpms. For your first big gear session, shoot for a combined work interval of 20 to 25 minutes. As you progress, increase the length and/or intensity of the sets. Adapt these sessions to match the specifics of your race. For example, if your race has climbs that take 10 or more minutes, build toward 10- and 12-minute sets, just above your race intensity. For shorter climbs or to create anaerobic stress, reduce the duration and work at a higher intensity—at or above your FTP/LTHR. 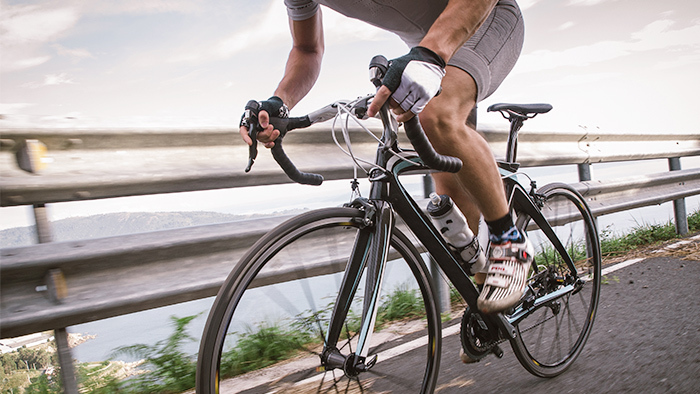 Longer endurance rides can include “hilly” wind sets, with a series of five to 15-minute big gear sets into a headwind. Recoveries are at least half of the interval time. Include these sets fartlek-style, when the wind conditions allow. Gradually adapt the total big gear riding time to meet the demands of your race. Bike handling is another key element to success on hilly courses. You want to maximize momentum on rollers, and safety and efficiency on the descents. To improve bike handling overall, you need to ride outside. Practice cornering, as that can be key to fast and safe downhilling. Take the time one weekend (or two!) to travel to a hilly route. Alternatively, you can register for a hilly prep race, which will give you the opportunity work on your handling in a race environment. Treadmills allow for varied hill sessions. To work on force and anaerobic fitness, short sets will do the trick! You can progress to 10 x 90-120 seconds, with 2-3 minute recoveries. Incline can be anywhere from 4 to 9 percent. For an extra challenge, gradually increase the incline across sets, while keeping the same pace. I call these sessions “frog boilers”— just like that little frog in hot water— you won’t realize how much you are “cooking” until you are in the middle of it. Then, come back down the pyramid. Hard sets are at 5 to 7-percent incline, while the recoveries are at 0 percent incline. You can turn up the heat on this one by trying to maintain the same pace throughout the entire workout. Run down the bridge/hill a little harder than you climbed it, focusing on quick, light cadence. Do NOT let your heel plant. Make sure your foot lands under your center of gravity (not out in front). Use your arms for balance. Form is key! Start with 30 minutes of repeats. Then, for each additional session, add 10 to 15 minutes. Depending on race specifics, you may top out anywhere from one to two hours of fast down running. Hilly races offer challenges that bring their own distinct rewards. Don’t let your flatlander status keep you from pursuing them. Go for your big mountain dreams with some strength-based tweaks to your training to simulate hill training so you can arrive fully prepared.